and stores to be put ashore in comparative safety. OUR FIRST landing on Marion, made from the Natal's motor-boat later tbat morning of Tuesday, January 20, was momentous for us and welcome, we soon learned, to the Transvaal's occupation party, who were still in possession. They were there on the landing stage and the beach to receive us and help us ashore. They were bearded and grimy, and their uniforms were creased and sadly soiled. We noticed that all were wearing sea-boots. We had brought their mail with us, and eagerly they clustered around while it was distributed. Those who had been lucky sat down where they were and were soon lost in thought among their letters. They seemed to find humour in the large number of Christmas greeting cards that had been so carefully redirected to them nearly four weeks after the event. Sara and I were shown the way to the bivouac on the cliff top, where, in the officers' lean-to, we found Lieutenant Sam Davis of the Natal trying to warm himself at an oil heater. The air temperature outside was around 45 degrees Fahrenheit in the sun. The tent was low and dark, and the few strips of comparatively level ground between ridges of rough lava rock were occupied by stretchers and a wooden table. Boxes, kit-bags, hurricane lamps and the usual miscellaneous assortment of articles inseparable from camp-life were stacked all around. On the table was the big square box of the "walkie-talkie" with its aerial rod passing out through a small hole in the roof. We were invited to make ourselves at home, as these would be our quarters while on the island. Davis introduced himself as having been sent ashore soon after the Natal's arrival in order to relieve McMurray. From Grindley and Davis we learned of the activities ashore and afloat since the Natal had made her first contact with the occupation party eight days earlier. I was able, later, to supplement their information with more from other members of the party, and with extracts from the Journal meticulously kept in turn by McMurray and Davis. During the night following the Natal's arrival, when rough seas had prevented her entering the anchorage, it rained heavily and the temperature dropped to within four degrees of freezing-point. Several heavy sleet squalls beat upon the bivouac. The rain did a good turn by flattening the sea and the swell, and by mid-morning the Natal was able to anchor and receive on board Grindley and Anderson, who transhipped from their dinghy to the frigate's motor-boat outside the kelp barrier. After receiving their reports, the Natal's Captain came ashore with them in the motor-boat, Grindley piloting it successfully through the kelp. Dymond brought with him Lieutenants J. McWade, a cipher officer of the South African Corps of Signals who had been seconded to the Natal for her voyage to take charge of the ciphering of all her radio communications. by the shore party, whose members were by now rather tired of a daily diet comprising mainly bully beef and biscuit. Coal and wood were other commodities that were eagerly received. A good blaze would be cheering in this bitterly cold weather. The landing operations were scheduled to go on after dark, and this necessitated the lights being switched on the frigate's quarter-deck where the boat was loaded. Not long after they had been turned on, it was noticed that birds were flying around the ship in ever-increasing numbers. Soon the air was filled with them and the whirr of their wings was like the ceaseless rushing of the wind. Among them were large numbers of small land birds. As daylight faded they seemed to become blinded by the electric lights, for they began to fly into the sides and superstructure of the ship. There fell to the deck or into the sea a rain of dead, maimed or stunned birds of all sizes and varieties. Many found their way down the alley-ways or through the port-holes into the interior of the ship, where they beat their wings pitifully against the bulkheads in vain efforts to escape. near the top of the mast. Their release brought no prolongation of their lives, however, for each was instantly pounced upon by a Skua gull which tore it to shreds in the air. Early the next morning the Natal had an alarming experience which brought home to all how treacherous was the weather in these high latitudes. From being comparatively calm the wind veered soon after dawn to the north-north-west and increased in force so rapidly that within 30 minutes a 40 m.p.h. gale was blowing. The anchorage was exposed and astern of the frigate was a lee shore. Immediately he realised that his ship was likely to be endangered Dymond ordered the anchors to be weighed. There was so much chain out that the windlass was able to haul it in but slowly and laboriously. Ten minutes after the order to weigh had been given the port anchor was home, but by now the ship was in real danger. With each gust she was sheering wildly on her remaining anchor, and despite the manoeuvring of her twin engines her stern had been driven almost up to the kelp barrier. It was difficult to control her, and to complicate matters the rising waves were beginning to slap over the fo'c'sle, endangering the anchor party. In the circumstances Dymond decided that there was no alternative but to sacrifice his anchor and cable rather than risk the ship and her crew further. Accordingly the cable was quickly slipped, and the frigate forged out to sea and safety. It had been a narrow escape from serious disaster, and its happy outcome was without doubt due to the cool head kept by Dymond and his officers on the bridge. The story went round the wardroom afterwards that when it seemed possible that the ship might be driven right up against the cliff the Navigating Officer had asked his captain for instructions on which side to put the gangway out! ashore, sir! May I signal her?" he cried. In a moment Grindley was at the tent door. He took in the situation in a moment, and did not fail to notice the figures on the fo'c'sle and bridge. There was no need to warn those on board the ship. He saw, too, that there was nothing that could be done from the shore to help them either. But it was some moments before Sorensen, bursting with the desire to help stave off disaster, came to the same conclusion and slowly put down the Aldis lamp that he had been itching to use. All hands just stood and stared in utmost suspense, until, minutes later, they saw the frigate begin almost imperceptibly to draw away from the danger. Then they broke into a cheer of relief. After that incident Dymond was wary of being caught again. He had to be more than usually careful now. Should he lose his second anchor he dare not stay down here longer. After the Natal had put to sea Grindley and Davis set off on an exploratory hike inland in a westerly direction. Near the top of a ridge about two miles from the camp they had a frightening encounter with Skua gulls. Since their arrival on the island they had noticed a definite increase in the hostility of these belligerent birds towards the newcomers. Their courage seemed to have increased with familiarity and they were no longer on the defensive. They seemed now to seek out opportunities to attack and they did so not only singly but in flights as if working on a pre-arranged plan. Thus Grindley and Davis suddenly found themselves being attacked by 10 or 12 birds which dived furiously at them from several directions simultaneously, uttering harsh cries as they did so and pecking wildly as if for their eyes. Both men drew their revolvers and fought back fiercely. It was not until they had killed and wounded a substantial proportion of the attackers that the survivors drew off. By that time the officers had used up every round of the 30 they had brought with them. After the battle Grindley was emptying his magazine when he glanced down casually and noticed his cartridge-cases falling among others that were larger and darker. Puzzled, he picked up one and examined it. It was apparently of .45 calibre and was fairly weatherworn. On the base was stamped the maker's name : H. Utendoerffer, Nurnburg. This was a surprising find. 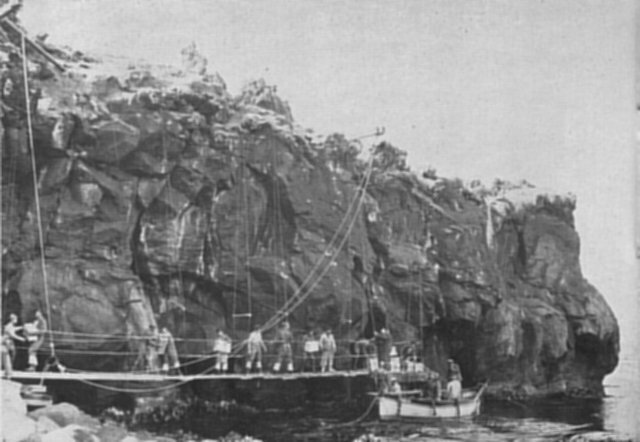 The officers were aware that the sealers usually dispatched their victims by shooting, but they also knew that there was no record of sealers having visited Marion since the Kildalkey expedition in 1930. They would have expected this cartridge-case, and the other three that Grindley picked up at his feet, to have shown more discoloration and other evidence of so long a period of exposure on the wet ground had they been lying there for 18 years or more. Nor did it seem likely that seal-hunting would be done so high up the mountain slopes, and so far from the landing beach, because the transport of the heavy carcasses to the try-pots at the water's edge would have presented great difficulties. southwards from the Indian Ocean trade routes each time their depredations there became known. Pocketing these interesting mementoes, Grindley and Davis returned to the camp. In the evening the Natal was sighted but after asking by radio for information on the landing prospects for the morrow she steamed off again. On the following day the wind was still strong and the Natal did not put in an appearance. The shore party spent the day transferring their small stock of explosives to a new site at a safer distance from the camp. Evidence was seen during the day of further hitherto unknown dangers to ships navigating the waters round the island. Grindley's trained eye noticed a sea break where there was supposed to be deep water about one-and-a-quarter miles east-north-east of the flagstaff. Every few minutes a sea broke in the same place. It was clear that there was an obstruction there not far below the surface. He took the bearing carefully and at the first opportunity passed on the information to the Natal. A check with the chart showed that the Challenger had sounded scarcely 100 yards to the east of this position and found 63 fathoms. Had she sailed a ship's length further to the west she must surely have ripped her bottom out upon the shoal. Though it was three weeks since the occupation party's arrival in these waters this was the first time that anybody had noticed the sea breaking at that spot. It continued to do so for only a few hours. Subsequent observations showed that it was only rarely, during a certain combination of wind, sea and current, that the reef indicated its presence in this way. We saw the break once from the Gamtoos during our stay. Though on a later visit the Transvaal kept watch for it and used to anchor within a mile of the reef's reported position she saw no sign of it during her three weeks' stay. of old newspaper files Captain Ree's story of how he lost the Solglimt. There seems no doubt that this was the pinnacle of rock upon which he came to grief. Thus narrowly did the Challenger share the fate of the Solglimt, and so might the Transvaal easily have done also had the bad weather when she first came down this way not forced her to abandon her original intention of making her landing here, and compelled her to seek another place. On the fourth day after her hurried departure, more favourable weather allowed the Natal to return and drag for her lost anchor and cable. She hooked it once but lost it again. Several hours more of monotonous dragging failed to locate it, and as the sea was now calm enough for boat operations Dymond decided to try to cut a passage through the kelp barrier in preparation for the arrival of the Gamtoos. The motor-boat dropped an anchor, to which a 44-gallon drum had been attached to serve as a float, on the seaward side of the kelp barrier. A grass line was then run ashore from the buoy and made fast around a rock. The whaler was hauled along the rope while her crew, leaning over the sides, hacked at the kelp with sickles. They found that once the leaves with their air-floats were detached the stems and stalks of the weed sank immediately. It was slow and backbreaking work, but before dark the whaler's crew had cut a fairly clear channel 50 to 100 feet wide, right through the barrier. The chief engineer of the frigate, Lieutenant Arthur Sharpe, had meanwhile had the leading edges of the motor-boat's propeller blades filed down, and she was now able to cut her way with little trouble through all but the most solid masses of weed. for two tarpaulin huts that were to be erected on the landing beach to house the army personnel coming in the Gamtoos. The Natal failed to recover her anchor, and as wind and sea conditions promised her a restless night in the anchorage she took the safer course and put out to sea. When she returned early the next day she was able to resume the landing of her supplies. The shore party were kept busy all day building the huts and constructing two derricks. These were to be used in landing cargo that was too heavy or bulky to be transferred to the landing stage, and thence carried ashore by hand along the catwalk. This heavy-lift apparatus comprised two strong timber booms, each 18 feet long, placed 54 feet apart and projecting horizontally from the cliff top, one over the landing stage and the other over the shore end of the catwalk. They were firmly fixed to the cliff with concrete foundations, strong timber props and wire stays made fast to the rocks. A system of ropes and pulleys linking the two would, it was calculated, enable weights of up to 2,5001b. to be slung from boats alongside the landing stage to the shore. After she had been less than four hours at anchor bad weather again forced the Natal to put to sea. She did not get an opportunity to return until three days later when she led the Gamtoos into the anchorage. In the interim the wind, rain and cold had hampered the construction work in hand on the island. More than once all work had to be suspended owing to the weather conditions. Thus it was that the huts were not completed until the Monday, January 19, while the finishing touches were put to the derricks only an hour or so before the Gamtoos and Natal were sighted the following morning. for the Transvaal's occupation party to end their 16-day exile and join the Natal. At 5.45 p.m. they withdrew and the Navy officially handed over the occupation of Marion Island to the Army.